"Saint Nectarius, the great wonderworker of modern times, was born Anastasius Kephalas in Selebria, Thrace on October 1, 1846. "My little Christ," he wrote. "I do not have an apron or shoes. You send them to me. You know how much I love you." Anastasius sealed the letter and wrote on the outside: "To the Lord Jesus Christ in Heaven." On his way to mail the letter, he ran into the man who owned a shop opposite the one in which he worked. The man asked him where he was going, and Anastasius whispered something in reply. Seeing the letter in his hands, the man offered to mail it for him, since he was on his way to the post office. The merchant put the letter in his pocket and assured Anastasius that he would mail it with his own letters. The boy returned to the tobacco shop, filled with happiness. When he took the letter from his pocket to mail it, the merchant happened to notice the address. Astonished and curious, the man could not resist opening the letter to read it. Touched by the boy's simple faith, the merchant placed some money in an envelope and sent it to him anonymously. Anastasius was filled with joy, and he gave thanks to God. A few days later, seeing Anastasius dressed somewhat better than usual, his employer thought he had stolen money from him and began to beat him. Anastasius cried out, "I have never stolen anything. My little Christ sent me the money." When he was still a young man, Anastasius made a pilgrimage to the Holy Land. During the voyage, the ship was in danger of sinking in a storm. Anastasius looked at the raging sea, and then at the captain. He went and stood beside the captain and took the helm, praying for God to save them. Then he took off the cross his grandmother had given him (containing a piece of the Cross of Christ) and tied it to his belt. Leaning over the side, he dipped the cross into the water three times and commanded the sea, "Silence! Be still." At once, the wind died down and the sea became calm. Suddenly, the captain began shouting, "Kephalas, Kephalas, come back here." The captain had ordered some men into a small boat to examine the hull in order to discover the source of the knocking, and they discovered the cross stuck to the hull. Anastasius was elated to receive his "Treasure," and always wore it from that time forward. 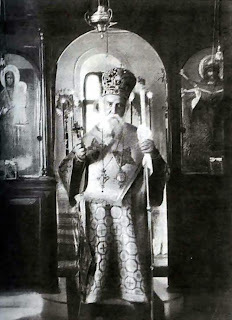 There is a photograph taken many years later, showing the saint in his monastic skufia. The cross is clearly visible in the photo. 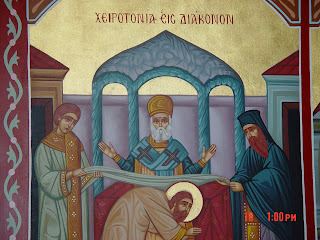 Other Metropolitans and bishops of the Patriarchate of Alexandria became filled with malice toward the saint, so they told Patriarch Sophronius that Nectarius was plotting to become patriarch himself. They told the patriarch that the Metropolitan of Pentapolis merely made an outward show of piety in order to win favor with the people. So the patriarch and his synod removed St Nectarius from his See. Patriarch Sophronius wrote an ambiguous letter of suspension which provoked scandal and speculation about the true reasons for the saint's removal from his position. St Nectarius bore his trials with great patience, but those who loved him began to demand to know why he had been removed. Seeing that this was causing a disturbance in the Church of Alexandria, he decided to go to Greece. He arrived in Athens to find that false rumors about him had already reached that city. His letter of suspension said only that he had been removed "for reasons known to the Patriarchate," and so all the slanders about him were believed. One day, as he was leaving the Minister's office, St Nectarius met a friend whom he had known in Egypt. Surprised to find the beloved bishop in such a condition, the man spoke to the Minister of Religion and Education and asked that something be found for him. So, St Nectarius was appointed to be a humble preacher in the diocese of Vitineia and Euboea. The saint did not regard this as humiliating for him, even though a simple monk could have filled that position. He went to Euboea to preach in the churches, eagerly embracing his duties. 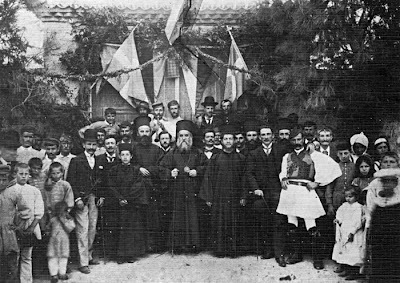 "[St. Nektarios] had once again fallen ill and suffered for fifteen days. He had headaches, dizziness and weakness. He literally dragged himself to his lectures [at Rizarios school]. His illness had probably been brought about by the extra work load he had secretly undertaken for the school custodian Loukianos. Loukianos had suddenly fallen ill due to failing kidneys, and having been overcome by excrutiating pain one day on the job, he had to be taken to the Evangelismos Hospital across the street. He then underwent a dangerous and painful operation and was ordered by his physicians not to return to work for at least two and a half months. Nektarios felt deep pity for the man and decided that he would do the work for him until he was able to come back. So, Nektarios would wake up at dawn and take to cleaning toilets and floors and whatever work was left undone by the assistant janitors." 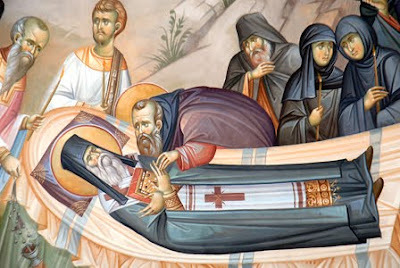 He gathered a community of nuns, appointing the blind nun Xenia as abbess, while he himself served as Father Confessor. 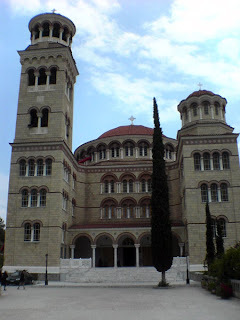 Since he had a gift for spiritual direction, many people came to Aegina to confess to him. Eventually, the community grew to thirty nuns. He used to tell them, "I am building a lighthouse for you, and God shall put a light in it that will shine forth to the world. Many will see this light and come to Aegina." They did not understand what he was telling them, that he himself would be that beacon, and that people would come there to venerate his holy relics. "Is he a monk?" he asked. "No, he is a bishop." The intern laughed and said, "Stop joking and tell me his name, Mother, so that I can enter it in the register." "He is indeed a bishop, my child. He is the Most Reverend Metropolitan of Pentapolis." The intern muttered, "For the first time in my life I see a bishop without a panagia or cross, and more significantly, without money." Then the nun showed the saint's credentials to the astonished intern who then admitted him. For two months St Nectarius suffered from a disease of the bladder. At ten thirty on the evening of November 8, 1920, he surrendered his holy soul to God. He died in peace at the age of seventy-four. 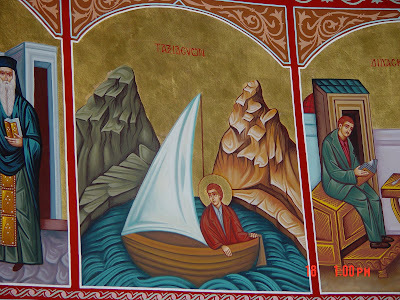 In the bed next to St Nectarius was a man who was paralyzed. 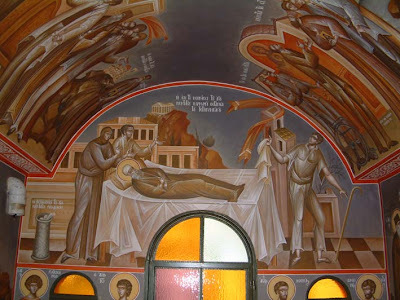 As soon as the saint had breathed his last, the nurse and the nun who sat with him began to dress him in clean clothing to prepare him for burial at Aegina. They removed his sweater and placed it on the paralyzed man's bed. Immediately, the paralytic got up from his bed, glorifying God. Several years later, the holy relics dissolved, leaving only the bones. *** The saint's head was placed in a bishop's mitre, and the top was opened to allow people to kiss his head. "There was a rich old lady who had met Nektarios at the monastery and he was her confessor several times. She was now living in Piraeus alone, and cried both day and night over the fact that Nektarios' body had dissolved. 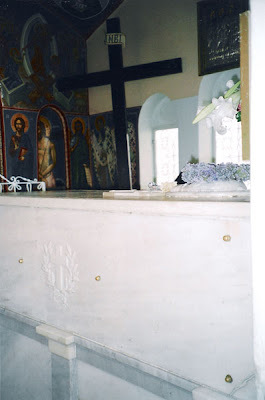 She hoped that Nektarios' body would be eternally intact, like the relic of Saint Dionysios on her native island of Zakynthos. She thought that this would be a tribute to Orthodoxy. One night, the old woman saw Nektarios alive at her bedside. He smiled lovingly and sweetly at her. "Why are you so sad?" he asked her. "It was I who prayed to God to allow the decomposition of my body. I did this for all the pious Christians, for whose consolation the relics will now be able to be sent around Greece and around the world." The old woman awoke a bit shaken, but was nevertheless filled with gratitude at seeing her beloved confessor alive and speaking to her." St Nectarius was glorified by God, since his whole life was a continuous doxology to the Lord. Both during his life and after his death, St Nectarius has performed thousands of miracles, especially for those suffering from cancer. 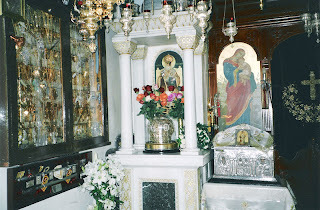 There are more churches dedicated to St Nectarius than to any other modern Orthodox saint." 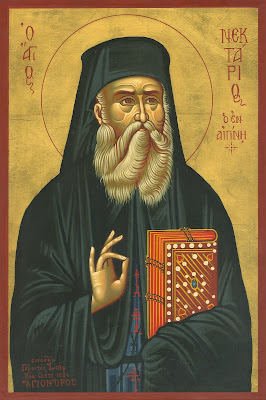 -SAINT NEKTARIOS: The Saint of our Century by Soitos Chondropoulos. May St. Nektarios intercede for us all and help us! 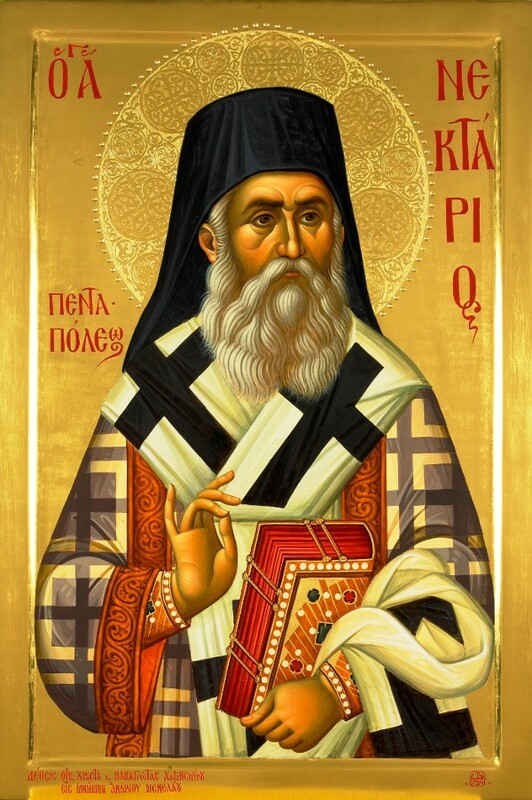 Devoutly, you led your life as a profound Hierarch; * you glorified the Lord with a most virtuous life, * O pious Nektarios; * hence, you were given glory by the Paraclete’s power; * you drive away the demons, and you heal the diseases * for those who faithfully approach your relics divine, O Saint. With hymns of praise let us extol in heartfelt jubilance * the lately shining luminary of the Orthodox faith * and the Church’s recent fortification. * By the action of the Spirit was he glorified, * and he gushes up the grace of cures abundantly * unto those who cry: * Rejoice, Father Nektarios. Rejoice, through whom the faithful are exalted; rejoice, through whom the foes are astounded.Rejoice, for of the holy fathers you were emulous; for you are the teacher of the Orthodox.Rejoice, most holy house of the energy of God; rejoice, God-written book of the new way of life.Rejoice, modern-day peer of the Saints and Fathers; rejoice, for you wisely kept your distance from matter.Rejoice, the radiant trophy of the Faith; rejoice, the dignified instrument of grace.Rejoice, through whom is the Church celebrating; rejoice through whom the Isle of Aegina is rejoicing. Αναρτήθηκε από ΝΕΚΡΟΣ ΓΙΑ ΤΟΝ ΚΟΣΜΟ στις 9:01 π.μ.